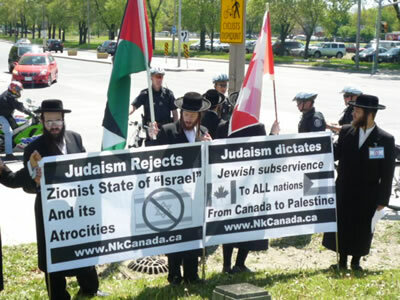 Anti-Zionist Orthodox Jews, organized by Neturei Karta International, demonstrated in	protest	during	the "walk-a-thon" fundraiser in Toronto, Canada called "Walk with Israel". 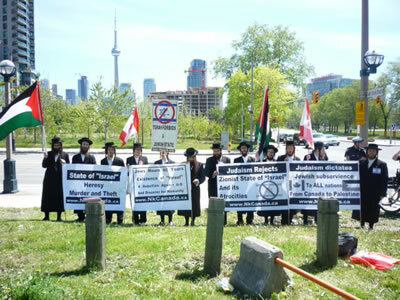 While the Zionists celebrate the 60th anniversary of the founding of the so called state of "Israel," the worldwide Jewish community faithful to the teachings of G-d and the Torah gather to commemorate this anniversary as a day of sorrow and tragedy. 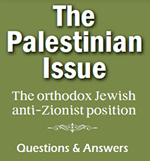 The founding of the Zionist state is in direct contradiction to the teachings of the Torah, which forbids the establishment of a Jewish state and commands Jews to remain in exile until released from that exile by G-d Himself, without any human intervention, at which time all Nations of the world will live together in peace. The Zionist intervention against G-d's will by establishing the "state of Israel" represents an official rebellion against G-d and the Torah, a rebellion which has generated untold pain and suffering. 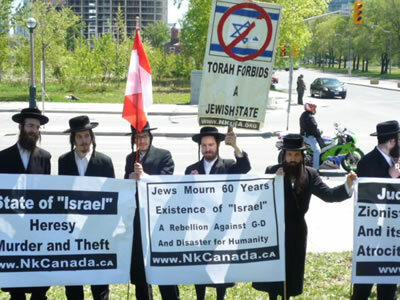 On the anniversary of the founding of this heretical Zionist state, true Torah Jews mourn the attempt to transform Judaism from a religion into a secular entity and the attempt to uproot the Torah teachings. We mourn the tragedies it has produced: desecration of the Sabbath, loss of modesty, and a litany of violations against many laws of our faith and Jewish teachings, amongst them the command of compassion for our fellow beings. The list goes on. We further mourn the deportation, subjugation, and oppression of the Palestinian people.